The internet is an amazing thing, as are all the digital products and devices that we all use on a daily basis. But what is even more amazing is how these devices and products can improve the lives of people across the world. There are lots of reasons why people do not make their products accessible and inclusive; sometimes it is as simple as they are not aware there is an issue or they do not know where to start. 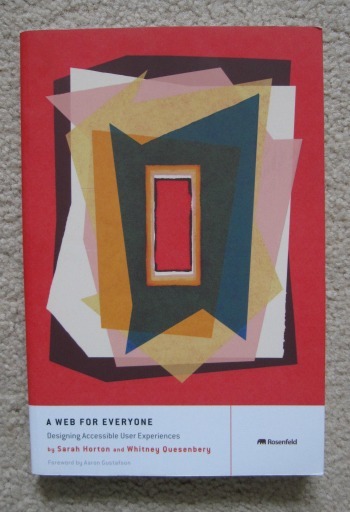 A Web for Everyone by Sarah Horton and Whitney Quesenbery is a great place to start. They do not want to stop you making beautiful web pages or apps. But they do want you to think about how you structure them and the code behind it, the colour combinations you use, the interactions you design and the content you create, amongst other things. The book starts with a chapter which gives eight different personas and details into what issues they might have with your product. Some are the sort of thing which always spring to mind when talking about inclusive design, for instance visually impaired users, while others are less obvious until you start thinking about it, for instance users whose first language is not English (for designers in the UK and America). Because there are so many issues out there, often experienced in different ways by different people it is impossible to create a product which is 100% perfect for everyone, but that is no excuse not to do anything and the book, chapter by chapter, talks the reader through how to make changes which will benefit all their users. Everything from how to structure a web page, to how to write inclusive copy and everything inbetween. This is a very accessible book which will open your eyes not just to the problems people have, but how to create products which will allow so many more people access. Although it is written from the point of view of creating websites, a lot of the advice can be used for other digital products too. The inclusion of the personas means you can really see the effect making these changes will have on people while the theory makes it easy to understand what changes need to be made. They might not get into the code of making changes, there are other resources for that, but they do point you in the right direction to get started. I cannot believe anyone can read this book and not want to make changes to the way they work to improve their product for everyone.